"Simply Enchanted Living by Rhianne Newlahnd opens our hearts to the beauty, delight, and magic that permeates our daily lives. Deeply informed by ancient teachings, the Enchanted Heart Wisdom Council grounds those of us who have reached a ‘certain age’ in the richness of our personal accumulated power. We can then step confidently into our new roles of being teachers and mentors for those who follow us. I’m honored to know Rhianne as a woman, friend, teacher, and role model. I encourage you to become your best you by opening your heart to a life filled with simple enchantments. " Enter Sanctuary for an Enchanted Heart Journey that will elevate, inspire and delight! This is a unique and powerful oracle and spiritual counseling tool I have designed as a tool of transformation. It is a system that allows you, the querent, to access your own inner wisdom by connecting with one or more of the 13 wise women teachers of the Heart Wisdom Council. I have conducted hundreds on this journey and I am a seasoned guide as well as a high level intuitive. This tool of transformation allows me to incorporate my skills as a hypnotherapist, energy worker, Destiny card reader, healer, Priestess and facilitator in a powerful and effective way. To begin our journey, we will create a beautiful Altar. Before the day of your retreat, Rhianne will send you both a form with some questions for you to answer about your life, your desires for the future, what you want to heal, what you love, what you want to inspire, etc. She will also find out your birthday. Meditating upon the desires of the two of you, she will create an Altar designed to invoke your intentioned desires to manifest, as well as create additional blessings and clearings for you. Tune in before you come to the journey and bring 3-5 items you feel called to add to the Altar. They can be crystals, jewelry, photos, etc. You will take these home with you and they will be energized by the day. You may also bring offerings that you might wish to leave for the Goddess, like flowers or chocolate! Once the Altar is made, we will discuss your symbols and intentions, light the candles and begin. Custom made Flower Essences to assist in the magical opening of our time together. During the year, as my flowers bloom, I make flower essences, adding special crystals and gems. I will offer a number of these for you to take during our opening ritual. A variety of Anointing Oils will be chosen made by incredible healers & mystics. You will receive this cut out Altar Card to take home and create your own altar with if you wish to. 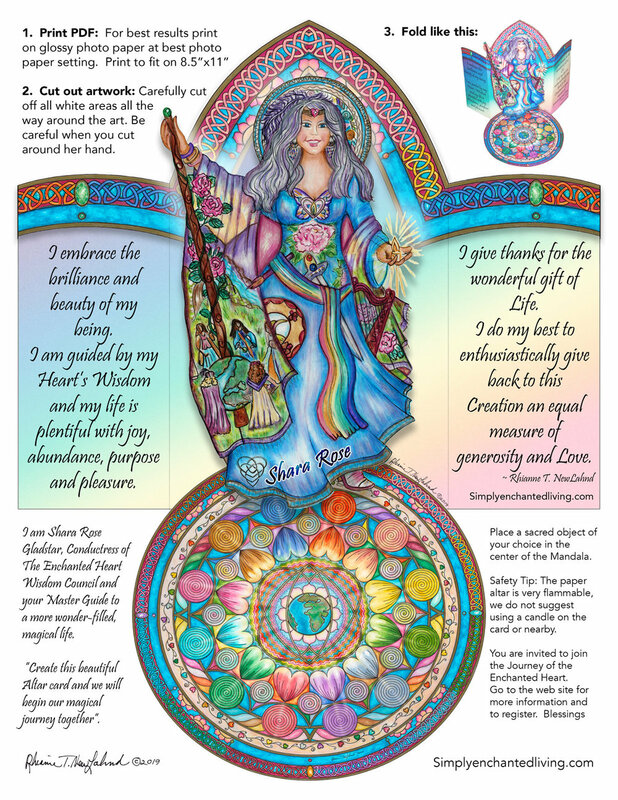 The Wise Woman Master on this card is Shara Rose Gladstar. She is the Conductress of the Enchanted Heart Wisdom Council and the center figure of the council. She stands upon the Mothers Mandala, which represents the generative field of love created when we enter the circle and work with the Wise Women, Divine Feminine Wisdom is granted to us when we open this portal. Sessions can be recorded by you or I, and photos taken. You will also receive some downloadable copies of the Wise Woman cards that you choose. We begin our sessions with the Sisterhood Session. This session will be with the three of us, and will focus on whatever the two of you decide you would like to experience together. The Wise Women I am sure will channel through and allow each of you to serve the other with wisdom. There are always surprises that emerge once the session has started, things we might never think to ask, and that is part of the mystical nature of the Oracle. I will also look at the relationship aspects from the Cards of Destiny (based on your birthdays), which can give some interesting insights about present and past lives, your connections, blessings and challenges. We will begin to speak with the Wise Women, and you will be introduced to the process of going within to access the wisdom they have for you. In this way, we will only need to explain and practice the system once all together. Individual sessions will focus on that which is most precious and important to each of you individually at this time. We will explore different questions and from 1-3 wise women will speak to you about your questions, concerns, or curiosities. You can choose who goes first. While the individual sessions are going on, the other person can choose to go to the garden to meditate, have a cup of tea on the patio, sit in the living room and listen to the other persons session or do a creativity session. I offer sessions where people can create a sacred object to take home with them. I would propose that, we set up a table of craft items, to create what I call blessing boxes. Lovely little wooden boxes that can be used on your altar, to put your wishes or blessings in, or for other sacred items. It is covered with pictures from magazines like a vision board, and embellished with jewels, feathers, or other elements that I provide. We could set this up and talk about it together, and, while one is getting a session, the other could be making her box. I supply all the materials, unless you have something from home to bring to glue on your box. We could set this project up in the studio where it is private, or in the living room where you could hear one another’s session. Of course, I will be busy so I can not be interrupted during the individual sessions, but if you can use glue, scissors, a glue gun, Opening to Creativity Session ( 25.00 per person additional for materials)etc, you should be good on your own. At the end of our sessions, we will have a brief closing ceremony to thank all the Wise Women, our guides and teachers, Nature and the Divine Feminine! At some point, we will take a break, depending on the energy, how it is going, etc. We can take the break whenever we want, and I will have some refreshments prepared. The refreshments will be gluten free and can be tailored to dietary needs. I will also provide teas or cold drinks as desired. If we wait until the end of our day, we can toast to a wonderful journey and all we have learned and shared together. Often times, after a journey such as this, questions arise after the experience. I offer a follow up of a written emailed answer to any of your questions, in which I will spend 30 minutes doing the best I can to answer you. These questions need to be asked within 7 days of the session while it is still fresh. Add ons to your retreat can include, full meals, photo shoot, sunset hike, extended time, massage and follow up session(s). Prices to be determined.